Dr. Stephen E. Malawista and his team were the first who described musculoskeletal features of chronic Lyme disease. The classical description of synovium (joint lining) affected by Lyme disease included surface deposits of fibrin, villous hypertrophy, vascular proliferation, and heavy synovial infiltration with mononuclear cells. The initial description of the Lyme synovium was based on the synovial biopsies. Introduction of high-resolution gray scale musculoskeletal ultrasound combined with power Doppler technique currently allows us to perform a very detail real-time noninvasive analysis of the joints, tendons and ligaments affected by Lyme disease. CASE: 61 year-old woman with history of subacute right lower extremity swelling and fatigue who was bitten by insects two months prior to the onset of her symptoms in upstate New York. 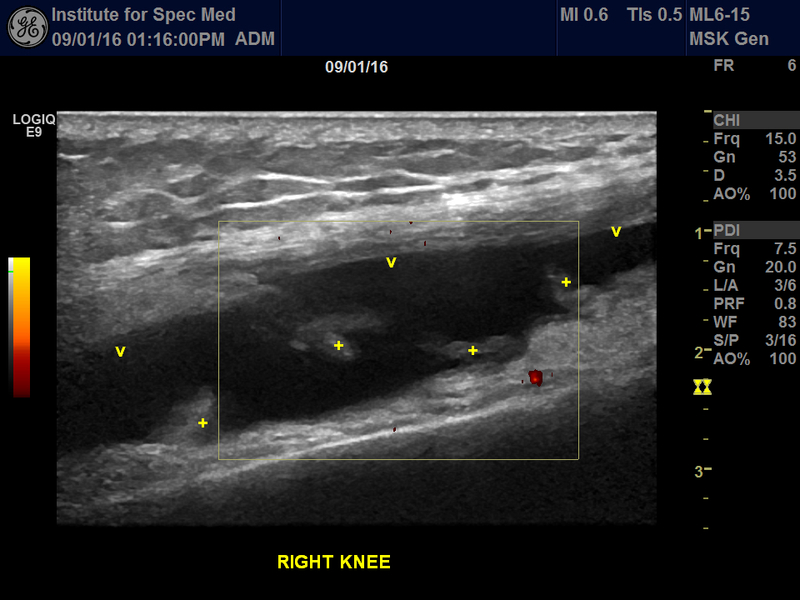 Musculoskeletal ultrasound of the right knee showed synovial effusion and villous hypertrophy in the suprapatellar compartment as well as effusion in the popliteal cyst. Analysis of the aspirated synovial fluid showed positive IgM Lyme Western blot and several positive bands in the IgG Lyme Western blot. 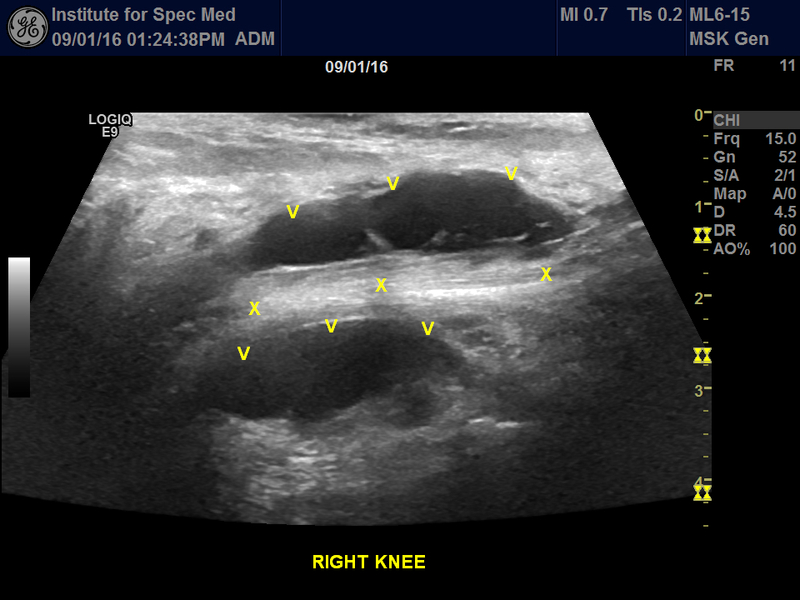 Transverse view of the suprapatellar compartment demonstrating effusion (V) and villous synovial hypertrophy (+). Transverse view of the popliteal area demonstrating effusion (V) in popliteal cyst above and below the medial gastrocnemius tendon (x). CASE: 55 year-old woman with a presumable history of rheumatoid arthritis who was seen in our clinic due to her poor response to the traditional therapy, including Non-Steroidal Anti-Inflammatory Drugs (NSAIDs), Disease Modifying Anti-Rheumatic Drugs (DMARDs) and biologic agents. 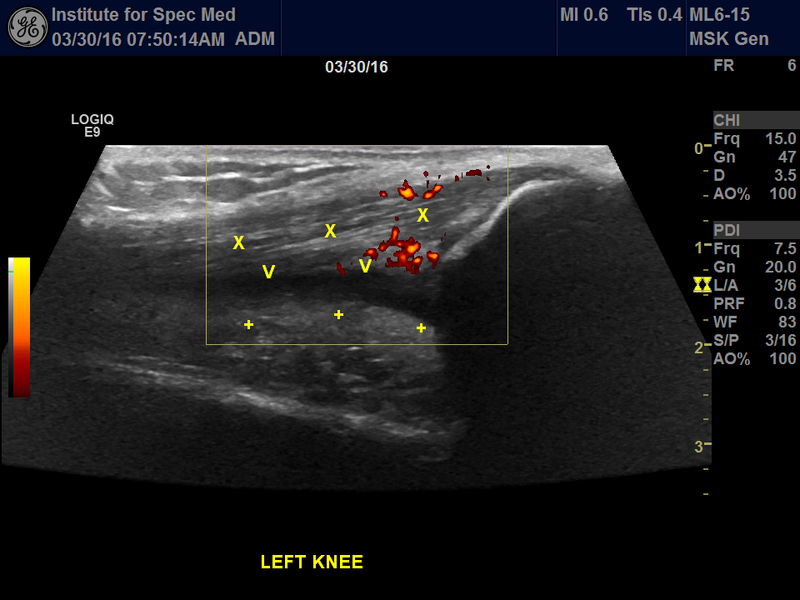 Musculoskeletal ultrasound of the knees demonstrated synovial hypertrophy and effusion in suprapatellar compartment as well as active quadriceps tendinitis. Her serum and synovial fluid analysis showed positive IgM and IgG Lyme Western blots. Administration of the antibiotic therapy in a combination with anti-microbial herbs resulted in a significant symptomatic improvement and resolution of the joint pain. Sagittal view of the suprapatellar compartment demonstrating synovial effusion (V), synovial hypertrophy (+) and active tenosynovitis of quadriceps tendon (x).